Dosbat: A Correction from the Brink. There comes a time in every blogger's life when a correction to a previous post is needed. Now is the time for me. This refers to my previous post. First I'd like to thank Crandles and Wipneus at Neven's Sea Ice Blog for putting me back on track. I'd posted a graphic showing the relationship between volume and area (PIOMAS and Cryosphere Today respectively). 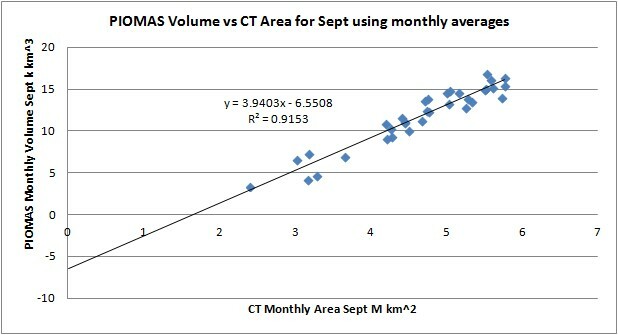 This shows the relationship between volume and area from 1979 to 2012, using September averages. What struck me was the good fit from a linear trend despite the complexity of changes since 1979. Using PIOMAS data, the trend can be broken down into contributions from ice under 2m thick and ice over 2m thick, which is a proxy for age. Thermodynamic growth in a season tends to be limited to less than 2m thickness of ice, processes like ridging then produce thicker multi year ice. So first year ice corresponds to the under 2m thick category, multi-year ice to the over 2m thick category. This shows what is already known, and what I've already blogged on; that most of the volume loss has been from thick multi-year ice, and that first year ice volume hasn't changed much. This is because first year ice responds quickly so can be replenished by rapid thermodynamic growth over the winter. Whereas it takes years to grow thicker multi-year ice. 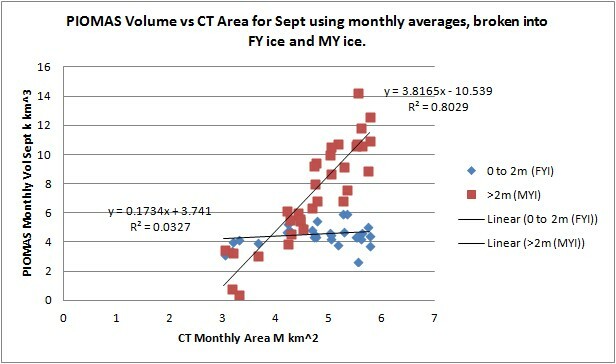 This means first year ice has little memory of multi-year losses, whereas multi year ice retains the impacts of volume loss and shows a decline of volume. As that graphic implies multi year ice is now almost totally depleted leaving a mainly first year ice pack. I swayed for a period earlier this week, between thinking that the first graphic not meeting the zero axis implied that a crash was the way this would be resolved, then thinking that the second graphic's lack of trend in first year ice meant that we'd see a reduction of volume loss rate, and the pack would last longer - as the models imply. Although nobody has pointed it out, I had also messed up the scale on the volume axis of my graphs, all told I was too tired to blog due to work pressures. However there may be a more simple explanation for the graphs above not meeting the zero axis. 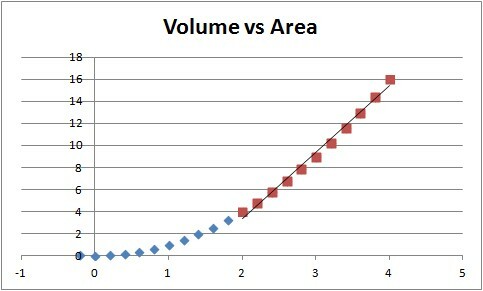 If one takes a linear decline of thickness and area, for example start at 4 for both, and decrement by 0.2 then the plot of volume vs area is plotted above. It's possible to fit a linear trend to an early part of the sequence that meets the zero volume at some positive area - seeming to be physically implausible. But that's because the trend isn't actually linear as the graph above shows. Note that this is a smooth linear decline in area and thickness, requiring no surprising non linear behaviour. I'm still interested in this issue, for one thing, the differences from the trend show a bow shaped behaviour, small at the ends, large in the middle, which isn't apparent in the first graphic of this post. However this could simply be hidden in the noise. So the most conservative conclusion is that the linearity is merely apparent, not real and that the actual curve is something like the one above. But there are important differences, the loss rate isn't linear, and the increasing loss rate of volume implies a real energy imbalance, one that was melting multi-year ice, but will now go into melting first year ice. I'm still expecting a rapid transition, but don't think my previous post contains evidence for such an event. All of this has come out of something I've been working on for a while, trying to explain the recent changes in the seasonal cycle. In my next few posts I'll be getting to grips with that, and I promise they'll be more reliable than my previous post.